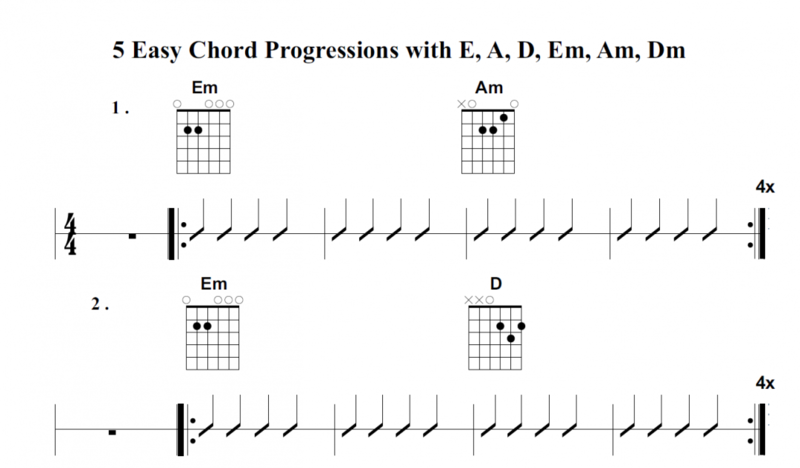 These exercises are for practicing chord changes using a selection of basic chords. Each quarter note (crotchet) is 1 down strum, so on the first exercise, Em has 8 down strums, then Am has 8 down strums and then you repeat the exercise until you have been aroud 4 times. Take the speed slow to allow time for changing chords. Aim for a steady and slow constant speed before increasing the tempo afterwards. Keep going around the repeats for a while on each exercise. The guitar and ukulele exercises 2-5 are compatible with each other so you can even play these exercises in groups with guitars and ukuleles together. These exercises are featured in the Basic beginners book 1 for Guitar & Ukulele. Related (Premium): Basic beginners book 1 for Guitar & Ukulele.